European companies just can't get enough of their U.S. rivals. Two German firms snapped up U.S. competitors for $25 billion before the opening bell Monday, looking beyond record stock prices and a stronger dollar to acquire advanced technology in booming sectors. In the bigger of the two takeovers, German drug group Merck KGaA (MKGAF) will buy Sigma-Aldrich (SIAL), based in St Louis, Missouri, for about $17 billion in cash. Merck is offering Sigma shareholders a 37% premium to Friday's closing price. Merck described the deal as a "quantum leap" that would create a life sciences business better able to compete in the market for research, drugs and biotechnology. Aging populations in the rich world and rising disposable incomes in many emerging markets are boosting demand for health care, even as many governments demand lower costs, driving a surge in corporate activity. There were 33 mergers and acquisitions in the sector in the second quarter -- worth $14.5 billion -- according to PwC, up from 23 in the same period last year. Energy is another hot sector. Siemens (SIEGY) said Monday it was buying Dresser-Rand (DRC), of Houston, Texas, for $7.6 billion in cash, or $83 per share. Dresser-Rand closed Friday at $79.91, up more than 17% for the week. Dresser-Rand is an oil services and power generation technology company. It will give Siemens greater exposure to the U.S. fracking boom. U.S. stocks hit new record highs last week, helped by a reassurance from the Federal Reserve that interest rates won't rise any time soon despite stronger growth that is boosting corporate profits. The dollar has gained 8% against the euro, and 3.5% against the pound, since May -- making U.S. assets more expensive for European buyers. But that isn't stopping executives eager to find stronger growth than Europe can offer. There have been 397 European takeovers of U.S. companies, worth nearly $156 billion, so far this year. That's up from 339 deals worth $25.6 billion in the same period of 2013. 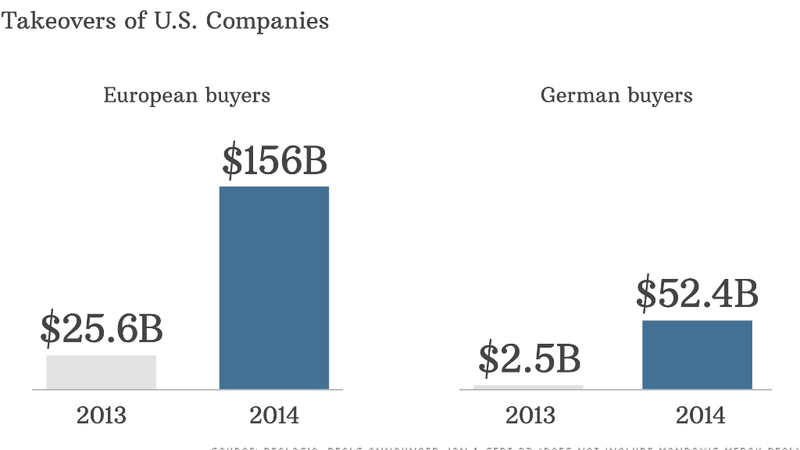 Of this year's deals, 55 were by German firms, up from 42 in 2013. The figures include the Siemens/Dresser-Rand deal, but not the Merck/Sigma-Aldrich deal.